In his free time, Joel enjoys photographing planets, stars, nebulae, and galaxies. All of the images below were taken by Joel. This is my favorite nebula, the Horsehead Nebula, imaged from the Nevada desert. I stacked images taken using the DSLR piggybacking atop my editorially mounted telescope using the telephoto lens (i.e., the picture was not taken through the telescope, just used its mount to track the sky). You can also see the Flame Nebula in the bottom left corner next to the bright star Alnitak in Orion's belt. I love the Horsehead Nebula so much that when she was six years old, my mom cooked me a Horsehead Nebula birthday cake. M33, the Triangulum galaxy, imaged with my Celestron 8SE. You can even see one of this galaxy’s bright nebulae, NGC 604, towards the bottom left. NGC 2403, a spiral galaxy 8 million light years away in the obscure constellation Camelopardalis. When you view this image, you're looking 8 million years back in time. Captured with my Celestron 8SE telescope somewhere in nowhere between the towns of Santa Barbara and Santa Ynez the night of December 8 2018. NGC 869, an open star cluster in Perseus. Imaged with focal length reducer on Celestrion 8SE. M45, the Pleiades or “Seven Sisters” star cluster in Taurus. Imaged with focal length reducer on Celestron 8SE. 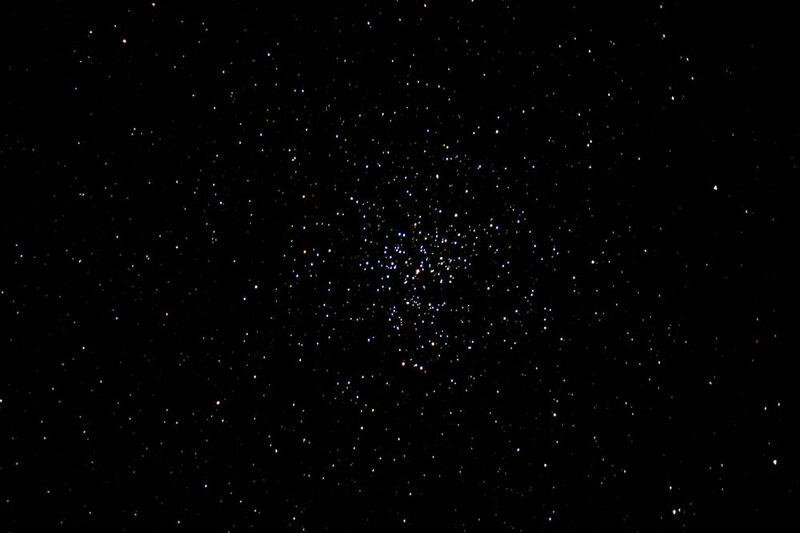 M37 is an open cluster 4,500 light years away in the constellation Auriga. You're looking at a single 30 second exposure taken out in the countryside between Santa Barbara and Santa Ynez. Telescope used was a Celestron 8SE with focal length reducer. 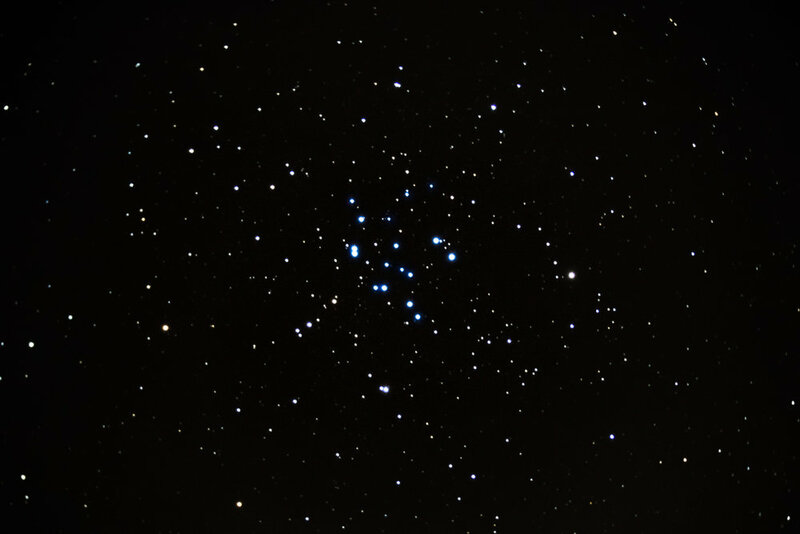 M34, an open cluster in Perseus. Focal length reducer on Celestron 8SE. 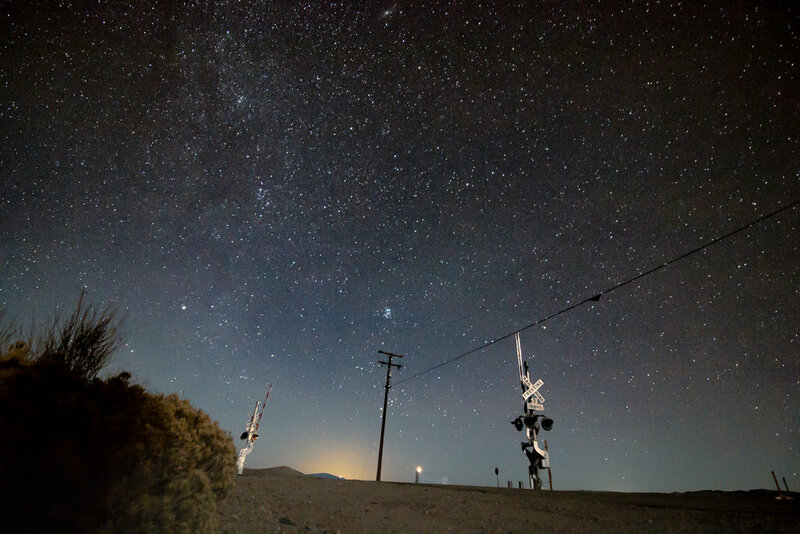 Starry sky over railroad tracks in the Mojave Desert. Mars, the Red Planet, as imaged through my 8" Celestron telescope from Malibu in October 2018. The bright white dot at the bottom is the Martian southern polar ice cap, which contains a layer of dry ice (frozen CO2) caked over water ice. In fact, the southern polar cap contains roughly 50 percent the amount of water frozen in Greenland's ice sheet. Will humans living on Mars melt and drink this water one day? 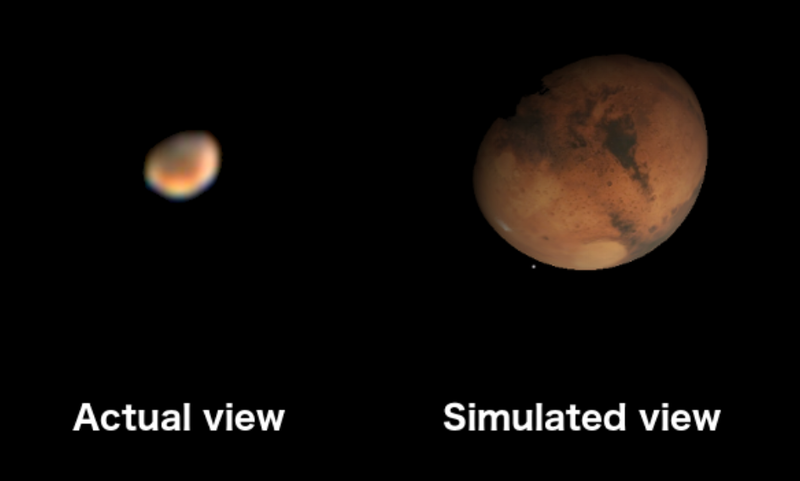 Mars as it appeared on October 28, 2018 through my 8" Celestron telescope (left) compared with a simulated view showing finer details in the Starry Night software program (right). I took the left image out my living room window from the comfort of my apartment. Mars was positioned such that its phase appears much like a gibbous moon from Earth. If I'm reading my map correctly, the northern most dark area is Meridiani Planum (landing site of the Mars rover Opportunity) and smaller dark area to the south is Noachis Terra. The bright white spot at the Martian south pole is dry ice (frozen CO2) caked over a vast amount of water ice. Martian astronauts might one day use the resources from the Martian polar ice to sustain a colony. Animated gif showing the motion of comet 46P/Wirtanen the night December 8, 2018. Comet 46P/Wirtanen on December 8, 2018. 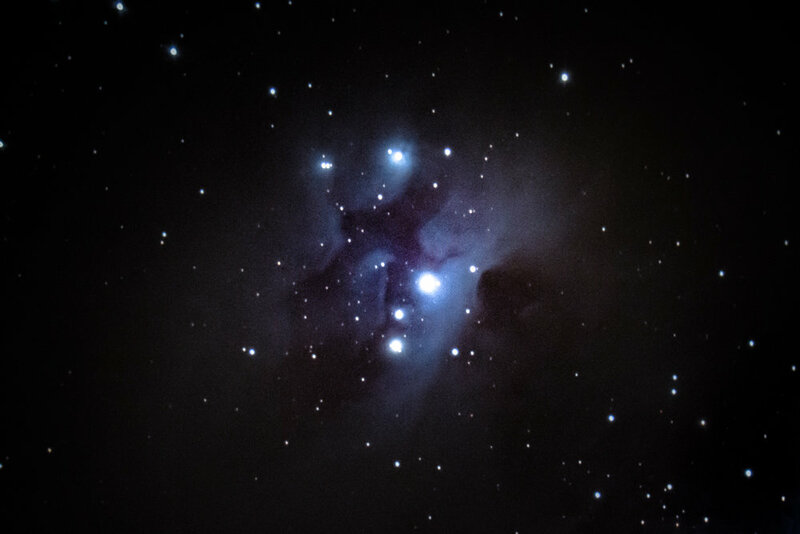 Single exposure through my Celestron 8SE. High dynamic range (HDR) image of 2% waxing crescent moon. 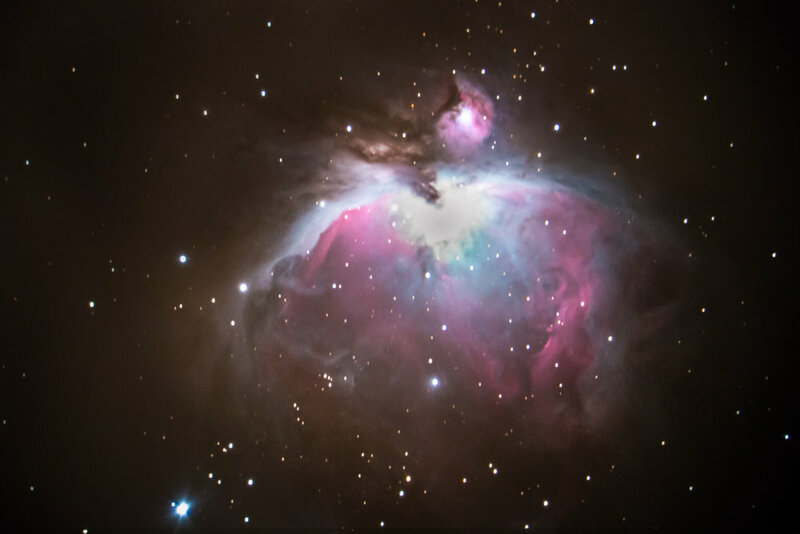 Image generated from stacked exposures taken with my Celestron 8SE with focal length reducer. High dynamic range (HDR) moon image created by stacking different exposures of the waxing crescent moon. The dark side of the moon is illuminated by earthshine. Waxing half moon, December 15 2018. Taken out my living room window in Los Angeles. Total lunar eclipse, January 20, 2019. This image was created from several frames taken through my Celestron 8SE at the end of totality as the Moon emerged from Earth’s shadow. Mare Imbrium through the Barlow lens of my Celestron 8SE. The prominent crater Plato can be seen top center. Annotated features on my moon images. 22° halo, also known as a Moon halo or winter halo. Ice crystals in the atmosphere refract light to create this beautiful phenomenon. This halo image was taken the night of December 21, 2018.